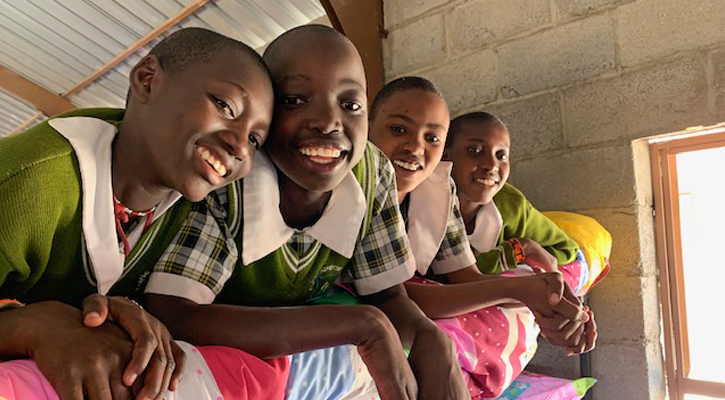 For most children, a new bed and bedding isn’t likely to elicit whoops of joy, but for 150 girls at the Kajiado Adventist School and Rescue Center, in Kenya, the dedication of a new dormitory and new beds, on March 8, was an occasion for extreme jubilation. “Thank you! Thank you Maranatha for the new dorm!” A group of girls shouted from the top of their bunks, which was topped with colorful new sheets, comforters, and pillows. 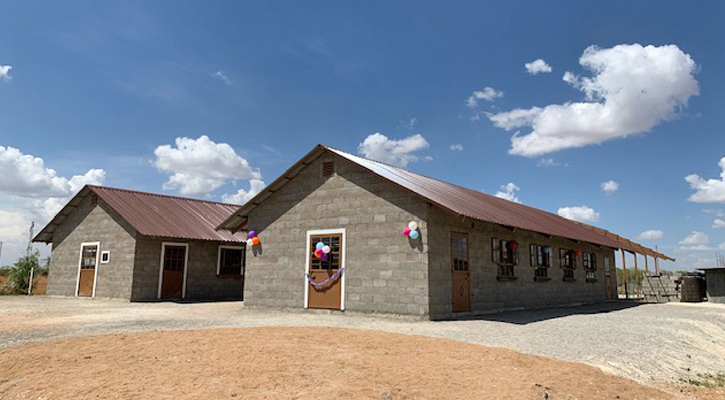 The new dorm was built by Maranatha Volunteers International during a mission trip that welcomed 26 participants from the United States. The group, while small, built a 20 by 60 foot structure in less than six days. They also moved in 72 beds, mattresses, and bedding, all of which the volunteers helped to fund. The Kajiado center is a haven for girls who have escaped the Maasai tradition of female genital mutilation and child marriages. Although illegal in Kenya, some tribes still carry out the ritual on girls as young as six years old before booking them to be married to an older man. Most of these girls are married by the age of nine and have multiple children by the time they are adults. This exchange brings the family a dowry of cattle, which is the Maasai’s currency and source of pride. Some girls choose to run away on their own accord or their mothers secretly warn them to escape. Young children end up navigating the dangerous Kenyan bush for days, often in the darkness where they can avoid being caught and returned to their villages. For those who actually reach a town or city, they can find protection at government agencies and places like the Kajiado center. The center, located 50 miles from Nairobi, was established in 2001. A group of Adventist women from Nairobi were looking to establish a ministry for children in Kajiado when they heard about the plight of Maasai runaways. The center is unique in that it not only offers the girls a home, it provides an academic program on campus so that the girls can adjust to their new environment and learn in a safe setting. They also offer trade classes, such as sewing. Sarah Daniel, director of the rescue center, estimates they have assisted 2,000 girls, some of whom have gone on to university. It’s a successful program, but after nearly 20 years, the facilities are in dire need of renovation and expansion. “The dormitory that we have is only supposed to [have] a capacity of not more than 80 girls, but currently as we speak the population in our dormitory is a hundred and fifty girls. And we don’t have enough beds that can serve even the 80.” said Daniel. Several girls sleep two or three to a bed. After learning of the need at Kajiado, Maranatha agreed to build two dormitories for the girls and a dormitory for the small population of boys. Each of the dormitories has an attached bathroom with multiple stalls, showers, and sinks. Maranatha will also build an administrative office. During the volunteer project, Maranatha also drilled a new well on campus to replace one that was not providing enough water, and the school had to spend precious budget on purchasing water. The new well, which produces a whopping 66-gallons a minute, was a miracle; geologists had warned that the chance of finding a better water source on the property was next to nothing. At the news, students raced from class to the drilling rig and immediately began singing songs of praise. After more than a week of excitement involving construction and a new well, the project culminated in a ribbon cutting ceremony for the new dormitory on March 8. During the program, the students performed songs and read messages of gratitude to the volunteers. “Honestly, our hearts are melting with joy since you have turned over a new leaf in our lives. We thank you for your valuable priceless talks and smiles we’ve shared together. We are so grateful for the sleepless nights and tiresome days you’ve had, just to ensure that we get new dorms, water, modern washrooms, and even new plans you have for our school. We may lack words to express our joy and happiness, but in our hearts we are really praying for you,” said Happiness Nempiris, a student in grade 7. After the ceremony, everyone entered the new dormitory and a gleeful chaos ensued. Girls shrieked as they touched the blankets and sat on the mattresses. 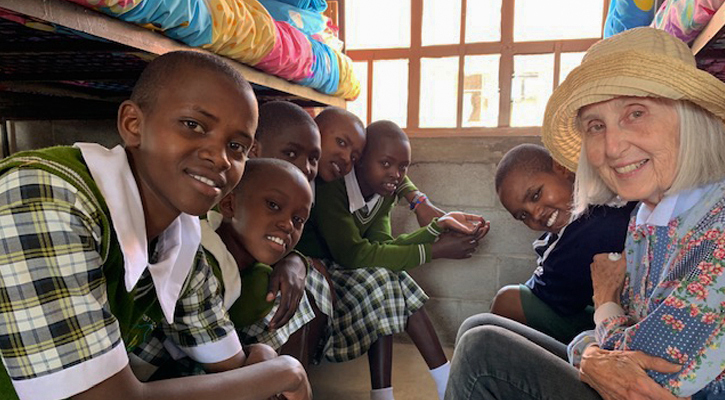 Having come from mud huts in the Kenyan bush, several girls said that they had never had a pillow before. More than once, the girls broke out in song. This is the second dormitory that Maranatha has built at the Kajiado school in less than a month. In February, volunteers with the SAGE (Seniors in Action for God with Excellence) were on campus to build the first girls dormitory. The building was dedicated in memory of Ken Lauren, a SAGE volunteer who died during a Maranatha project last year. Watch how God provided water at Kajiado.